He’s been Champion Jockey multiple times, claimed all the biggest races on the National Hunt calendar and he’s even won the BBC Sports Personality of the Year Award. Now AP McCoy gets to star in his own video slot in AP McCoy: Sporting Legends. Created by Playtech, it’s a 5 reel, 243 ways to win game that comes with a free spins round where multipliers can reach up to 49x. You can also spin in Power Play mode for accumulated wins and added wilds. You’ll also have a shot at landing 1 of 3 progressive jackpot prizes. Stakes range from between 25p and £1,250 per spin. There’s nothing very flashy about the design in AP McCoy: Sporting Legends. At first glance you’d be hard pushed to see that it’s a horse racing themed video slot. The plain reels feature lower value royal values alongside a gold cup, a helmet, a badge and AP himself riding a horse. The best symbol is the head shot of the great man himself. Land 3, 4 or 5 of these on adjoining reels and you’ll win 4, 10 or 100 times your total bet. There’s also a wild. The bonus wheel appears on reels 1, 3 and 5 only. Land 3 of them on the same spin and you’ll trigger the Bonus Wheel feature – on offer here are 10 free spins. You’ll have a chance to add to that tally as well as bringing win and wild multipliers into play by spinning the Bonus Wheel. Also on offer are cash prizes of up to 1,000 times your bet. After each spin of the Bonus Wheel, the centre portion will spin. If it lands on spin again, you’ll get another crack of the Bonus Wheel. If it lands on Go To Spins, you’ll play the Winning Line Free Games feature with the accumulated multipliers. These can reach up to 7x. If you get 2 wilds on a wild, these are multiplied to reach up to 49x! AP McCoy: Sporting Legends also let you up your stakes to spin in the Playtech Power Play feature. This is a series of 5 linked spins where all the previous payouts are added together if you land a new win. For example, if you won £2 on spin 1 and £4 on spin 3 and then land a £5 win on spin 5, you’d get an accumulator payout of £11 on that fifth spin in addition to the earlier wins. More expensive is the Accumulator Plus Power Play Mode which brings extra wilds into play. You’ll also get a super spin where the accumulated wilds are added. 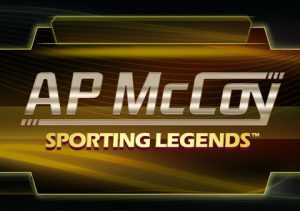 AP McCoy: Sporting Legends is part of the Sporting Legends series which offers a chance to land a daily, weekly or monthly progressive jackpot prize. These can strike on any spin. We’ve found a lot of racing-themed video slots to be real hit and miss affair. This one isn’t perfect but it does have its charms. The best action comes via the Winning Line Free Games feature. Get lucky with the multipliers there and AP McCoy: Sporting Legends could prove to be a winner. I do prefer more traditional themes and Playtech offers some of the best video slots around – such as Legend of the Jaguar and Terminator Genisys.